Denny Hamlin Will Miss Six Weeks Of NASCAR Racing, So What Happens Next? After Sunday's last lap NASCAR altercation in Fontana, and Monday's news that involved driver Denny Hamlin had damage to his spine, it seemed clear that Hamlin would miss races. A few days ago, his Joe Gibbs Racing team made it official, and at the present it seems like Hamlin will be absent for six weeks, encompassing the races at Martinsville, Texas, Kansas, Richmond and Talladega, returning in time for the Southern 500 at Darlington. So, what does this mean for Hamlin's season, and who will drive the #11 Joe Gibbs Racing machine in the interim? Right now, the first question is far easier to answer than the second. Assuming Hamlin only misses five races, we can combine last year's championship standings and his career average finish at each track he'll race at once he returns to see that he likely will remain in the top 20 in points come Richmond. If he can do that and score at least two wins, he'd likely have a "wild card" ticket for NASCAR's playoff system, "The Chase", and thus will still be able to contend for the championship. Even if he can't do this, his team can still contend for a championship on their own, as car numbers accumulate points in the same way that drivers do in a separate "owner's points" championship. If the replacement driver can keep the car in the top 10 in these owner's points standings, the 11 car will be eligible for The Chase on it's own, and thus could contend to create a split championship with whomever wins the driver's title. The first contender is Elliott Sadler. He spent 12 years in NASCAR's top Sprint Cup Series for varying teams before falling to the second tier Nationwide Series in 2011, and in 2013 began driving for Joe Gibbs Racing in that series. He's already signed on to run three races for JGR in a fourth car for them, numbered 81, but even to this point he's yet to drive one of the new-for-2013 "Gen 6" racers. He would be open to run the car in the first four races, but his commitments to the 81 wouldn't allow him to run the 11 at Talladega. Yesterday he was the favorite for the seat, but things appear to have changed over night. The second contender is Brian Vickers. Another driver with significant Cup experience, Vickers spent his first Sprint Cup Series career between Hendrick Motorsports and Red Bull Racing. Like Sadler, he runs in the Nationwide Series for Joe Gibbs Racing, but unlike Sadler, he also has significant experience with the "Gen 6" car, as he is running a part time schedule for Michael Waltrip Racing in their 55 car, sharing the seat with Michael Waltrip and Mark Martin. He has commitments to run the 55 at Martinsville, but is free to drive the 11 in the four races afterward. MWR and JGR are two separate teams, but together they are essentially Toyota's factory teams, and thus them sharing a driver across the top series would not be unprecedented. The third, and least likely, candidate is Michael McDowell. For the past two years, he has run a part time schedule in Joe Gibbs Racing's Nationwide cars, having notably contended for wins on the road courses of Circuit Gilles Villeneuve and Road America, and in those years he served as a reserve driver for the team in all levels of competition. He brings some minor cup experience, including a few races in some heavily underfunded "Gen 6" cars owned by Phil Parsons Racing, and he ran for JGR last time they needed a replacement driver, when Kyle Busch was suspended in 2011. Before the addition of Sadler and Vickers to the JGR Nationwide program over the offseason, he would be considered a lock for this seat, but with more options in 2013, it's hard to imagine the 11 team fielding cars for McDowell over the next five weeks. It's not known if he has any sponsor commitments in Parson's 98 car. 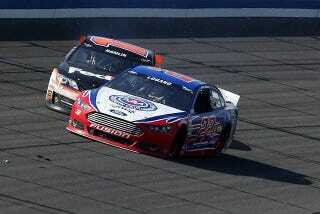 The final candidate emerged overnight, and is again a driver of MWR's 55 car: 54 year old Mark Martin. Martin has decades of Cup experience, has run all but one race in the new "Gen 6" car to this point, already has a pole this year in his #55 MWR machine and like the other candidates has run some Nationwide Series races for JGR in the past. MWR would need to agree to the swap and Martin flat out refuses to drive at Talladega, but for the other four races he seems like the most viable candidate available. Vickers would logically replace Martin in the 55 in the interim, save the Talladega race, where team owner Michael Waltrip is committed to the car. For that final race, I would assume that either McDowell or Vickers would jump in the JGR #11. It seems that none of these four will run all five races, but as it stands right now, it looks like Martin will run the majority of the events. Regardless, if Hamlin returns to the car on time, it'll be up to him to get his car back in contention, and a replacement driver can only help with the owner's points championship. With an off weekend between now and the Martinsville event, don't be surprised if the replacement driver announcement doesn't come until Monday, at the earliest.